The overall expenditures on maintenance and repairs at a modern productive enterprise can reach one-third of all production cost. Reduction of such costs has important influence on decreasing of prime cost and provision of enterprise competitiveness on the market. The T-FACTORY.exe™ 6 EAM (Enterprise Asset Management) is a real time EAM system, fully integrated with enterprise process control systems. The T-FACTORY EAM offers the plant management a key instrument for asset management, targeted to equipment productivity enhancement and providing the operating cost reduction. generating reports automatically, and calculate the indices, required for decision making. The T-FACTORY 6 EAM allows to represent all enterprise assets (equipment) as an hierarchy of EAM-objects. For each EAM-object the EAM server automatically calculates maintenance statistics, cost, events, job tickets, material orders etc. The EAM statistics may be uplifted to the higher level EAM objects. The values calculated for the descendant will be automatically accounted in the parent EAM object. For instance if a propeller blade of the pump 1-56 will need repair, the T-Factory EAM server will generate a job ticket for repair of the pump. Moreover the repair cost for the propeller blade will be attributed to all upstanding EAM objects – chamber, pump 1-56, pump station and main cooling system. The appropriate data about downtime will be accounted for all these objects. The T-Factory EAM allows creating an unlimited number of trees of objects for different hierarchies – administrative (factory-shop-site-plant), geographical (building-floor-room-equipment) or any other. These hierarchies have no influence whatsoever upon each other, however, these allow to represent an EAM-project in the form convenient to user. For each EAM-object of any hierarchical level, a record card is created, containing dozens of administrative, technical, and economical parameters for equipment. Any equipment record card of can be linked to the corporate DBMS (e.g. to the book-keeping system, for the purpose of automatic calculation of depreciation, or otherwise, for receiving reference information about the spare parts, etc). In the two last cases the information required for activation of services of the T-FACTORY 6 EAM, is taken from the TRACE MODE® 6 control system real time servers (SCADA or SOFTLOGIC). Using TRACE MODE® 6 in combination with T-FACTORY 6 EAM is the most convenient and reasonable way, because the most of EAM parameters are already available in the control system project, however, the T-FACTORY 6 server can also operate with other SCADA and SOFTLOGIC-programs, via standard interfaces – OPC, DDE, ODBC. The T-Factory EAM integration of with control systems allows implementation of the modern technology of predicting maintenance, where possible malfunctions in operation of the equipment are eliminated prior to their occurrence. According to activated EAM services, the system generates work orders and material orders. The orders are transferred to T-FACTORY 6 EAM planning subsystem. cancel or approve the works. In the T-FACTORY 6 EAM, convenient tools are provided, for network planning and perspective planning. Planning can also be performed in external programs – for example, in MS Project®. Approved work orders are automatically directed to executors. Stages of execution of the works are registered by the EAM system and are always accessible for verification by higher ranking management. Upon completion of works as per each work order, statistics of time and cost of execution is calculated. as well as other parameters. The T-FACTORY 6 EAM enables easy accounting and maintenance of production equipment, and helps the enterprise to shift from emergency driven to the planned preventive and even to the predictive maintenance practice. T-FACTORY 6 EAM offers information for investigations of failures, improve logistics, enables planning of manpower, material, and energy resources. 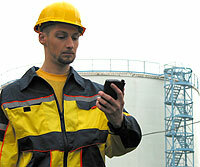 In addition, the T-FACTORY EAM allows to perform accounting of maintenance cost. The enterprise using the T-FACTORY EAM, could extend the equipment operation life, cut the downtime caused by equipment failures, control the maintenance costs and enhance the overall equipment productivity.